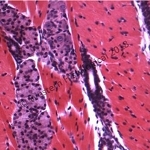 A077 Smooth, striated and cardiac muscle, composite, V.S. A078 Smooth muscle, teased, individual cells, W.M. A079 Striated muscle, teased, individual cells W.M.